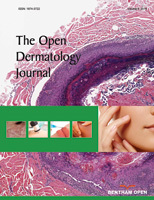 The Open Dermatology Journal is an Open Access online journal, which publishes original research articles, review articles, letters and guest edited single topic issues in the field of dermatology, aiming at providing the most complete and reliable source of information on current developments in the field. This journal publishes open access reviews on recently published books (both print and electronic) relevant to the journal. Publishers and authors of books are invited to contact our book reviews editor at todj@benthamopen.net with book review requests. All submitted books will be reviewed by an independent expert in the field. No page charges will be levied to authors for the publication of book reviews. Manuscripts for research articles and letters submitted to the respective journals should be divided into the following sections; however, there can be an extension in the number of sections in review articles in accordance with the requirements of the topic. Trial Registration. If your research article reports the results of a controlled health care intervention, list your trial registry, along with the unique identifying number, e.g. Trial registration: Current Controlled Trials ISRCTN73824458. Note that there should be no space between the letters and numbers of your trial registration number. For this purpose, a clinical trial is any study that prospectively assigns human subjects to intervention or comparison groups to evaluate the cause-and-effect relationship between a medical intervention and a health outcome. All clinical trials, regardless of when they were completed, and secondary analyses of original clinical trials must be registered before submission of a manuscript based on the trial. Studies designed for other purposes, such as to study pharmacokinetics or major toxicity (e.g., phase 1 trials), are exempt. Trial registry name, registration identification number, and the URL for the registry should be included at the end of abstract and also in the space provided on the online manuscript submission form. If your research article reports the results of a controlled health care intervention, list your trial registry, along with the unique identifying number. Note that there should be no space between the letters and numbers of your trial registration number. Authors will submit the Trial Protocols along with their manuscript. The CONSORT (Consolidated Standards of Reporting Trials) Checklist and Flowchart is also required when submitting the results of randomized control trials (RCTs). Jellinek N. Nail matrix biopsy of longitudinal melanonychia: diagnostic algorithm including the matrix shave biopsy. J Am Acad Dermatol 2007; 56: 803-10. Feder HM Jr, Abeles M, Bernstein M, Whitaker-Worth D, Grant-Kels JM. Diagnosis, treatment, and prognosis of erythema migrans and Lyme arthritis. Clin Dermatol 2006; 24: 509-20. Wahlberg JE. In: Kanerva L, Elsner P, Wahlberg JE, Maibach HI, Eds. Diagnostic patch testing. New York, Springer 2000; 371-4. Odom R, James W, Berger T. Andrews’ diseases of the skin. 9th ed. Philadelphia: WB Saunders Co., 2000. Arndt KA, Dover JS, Eds. Controversies & Conversations in Cutaneous Laser Surgery. Chicago: AMA Press; 2002. Schulze zur Wiesche E, Bossmann B, Dreja M inventor. Shaped bodies for forming cosmetic preparations. United States patent US7204856. 2007 Apr. All authors must strictly follow the guidelines below for preparing illustrations for publication in The Open Dermatology Journal. If the figures are found to be sub-standard, then the manuscripts will be rejected. Note: Availing Graphics Enhancement Services do not guarantee acceptance of the manuscript for publication. The final acceptance/decision on the manuscript is taken by the EiC.